The LVMPD-Las Vegas Metropolitan Police Department is distributing this Crime Alert Notice with the intent to advise you of criminal activity that may affect you and your community. During the past two months LVMPD has responded to several reported residential robberies that we believe are related. 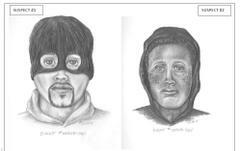 These residential robberies have taken place throughout the Las Vegas valley. Please review this Crime Alert for suspect descriptions and sketches of who we believe are responsible for these robberies. Both suspects are to be considered armed and dangerous. The Las Vegas Metropolitan Police Department is requesting the public's assistance in identifying and located these suspects. Residents are urged to lock their doors and windows as a basic form of prevention. It is also recommend that if you are at home and someone knocks on the front door to NOT open it but to speak through the locked door. By NOT opening the door and speaking with them through the locked door this helps keep you safe while letting them know that someone is at home. Avoid criminals entering your home by always keeping your garage door(s) closed at ALL times! Please help us fight crime by immediately calling Metro Police Non-Emergency number 311 on all suspicious activity because you may be preventing/stopping a crime in progress. We are depending on you to call us whenever you observe suspicious persons, activities or vehicles anywhere in your community.